New Kansas State coach Bruce Weber now has three games at Bramlage Coliseum under his belt. Friday night’s 85-52 win over North Dakota was the first official game for him at the helm. You can read my full recap of that game here, but at the moment I just want to run down a few observations of the team to this point. 1. Kansas State has the makings of an excellent frontcourt. In Thomas Gipson and freshman D.J. Johnson, the Wildcats have strong, powerful guys who have an advantage securing position for rebounds and who can dominate in the paint with their back-to-the-basket moves. In Jordan Henriquez and Adrian Diaz, the Wildcats also have lean, long guys whose presence dissuades teams from even coming in the paint because they can so easily block such shots. Because of their height they are difficult to guard around the basket, and Henriquez has been working on a hook shot that makes him dangerous further away from the hoop too. Those four are going to present a unique challenge for Kansas State’s opponents this year. 2. The play of Angel Rodriguez is going to be so important to this team. The Wildcats could not open up a double-digit lead over North Dakota during the entire first half, much of which Rodriguez was sitting because of foul trouble. When Rodriguez returned after the break, he drained consecutive 3-pointers and slithered through the paint for a layup. Eight straight points. That sequence gave Kansas State momentum and turned the tide of the game. Weber said yesterday that the team goes as the guards go, and Rodriguez is obviously a huge part of that. He has all kinds of potential, but harnessing it consistently is easier said than done. Whether he is able to do so will determine how good these Wildcats can be. 3. The production of Nino Williams has been fascinating to watch. After hardly getting any time under former coach Frank Martin, he looked fantastic in both exhibition games, and he earned his first career start on Friday night against North Dakota. He promptly scored the team’s first points, and he snagged five rebounds as well. Williams may not start throughout the season, but he provides a nice jolt of energy for the Wildcats, so even if he comes off the bench, you can expect him to have a significant role this year. In the words of Kansas State coach Bruce Weber, the Sunday contest against Emporia State was a typical second exhibition game. While Tuesday’s contest against Washburn had players excited just to play against people other than their own teammates, Sunday’s matchup arrived with less hype, and so the intensity level suffered. That did not happen enough, especially early in the game. Both teams started slow, missing shots, until an 8-0 run by Emporia State gave the Hornets a 19-18 lead with five minutes to play in the first half. Weber called timeout and made some substitutions – including D.J. Johnson and Thomas Gipson in favor of starting forwards Jordan Henriquez and Adrian Diaz. “I told them, ‘Hey, I’ll try not to sub you on each mistake, but you do two or three mistakes or you don’t give the effort you need, you give me no choice but to make that decision,'” Weber said. After the timeout, the Wildcats reeled off nine straight points to take a 27-19 lead. That was just the first segment of Kansas State’s 20-4 run the team compiled before halftime. As with most exhibition, non-conference games, the outcome was a function of play in the paint. The Wildcats snagged 51 rebounds to Emporia State’s 26. They scored 28 points inside to the Hornets’ 8. They earned 21 second-chance points to Emporia State’s 5. By the end of the game – which got progressively more out of hand as the Wildcats dominated the boards – Johnson had scored a team-high 17 points with 9 rebounds, while Gipson added 12 and 5. Weber said so far he has kept playing time fairly balanced to see how everyone plays so he can get a lineup set. The underlying message is that the starting rotation is not solid. Anybody has a chance. 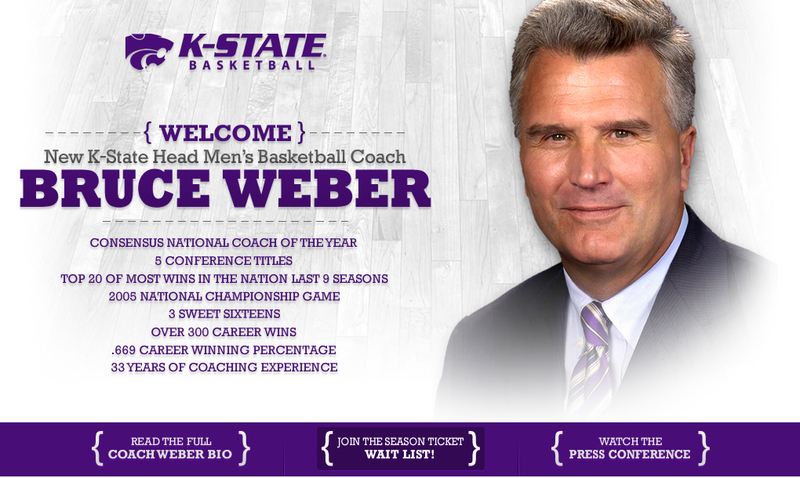 Google "Kansas State basketball," and you will see the front page of the website dedicated to new coach Bruce Weber. With that statement, Bruce Weber dared Kansas State fans to have some faith. Weber began his coaching career back in 1979, so he has extensive experience in the business. In 2003 he had the difficult distinction of being Bill Self’s replacement, so this move to Kansas State will not be the first time Weber walks into a situation where many fans really wish the last coach was still there. Widespread disappointment about the departure of Frank Martin is ironic in a sense, considering many fans were rather unhappy when the Wildcats made a head coach of the unproven coach five years ago. If anything, Martin’s success should be a reason for fans to support Weber, at least until he gives them a reason to do otherwise. Another example of unexpected success has to be Frank Haith at Missouri; many were skeptical of him, and the Tigers went on to win the Big 12 tournament. I understand being upset when a team is not winning, but no games have been played yet with Weber at the helm, so he should have a window of several months before any legitimate complaining by fans can occur. Certainly it is a possible that Weber will be a flop. Maybe players will leave. Maybe he will not be able to recruit. Maybe the team will lose a dozen games or more. On the other hand, maybe Weber will be a breath of fresh air after Martin. I will not say one is better than the other; I do not know either well enough to make any declarations on that. What is clear is that the two of them have vastly different styles. Their personalities are different. Maybe Weber’s personality facilitates better interaction and communication between coaches and players this season. Maybe that change translates into more wins than anyone would expect. All I am saying is this: “I told you so!” is much more fun when the outcome you guessed was positive rather than negative. Before last football season, I predicted eight wins. Obviously I undershot; the Wildcats won 10 games and went to the Cotton Bowl. However, other media members and fans were saying that seven wins would be optimistic; six would be realistic; and eight, well, that was the stuff of dreams. See how that season turned out? It was beyond the stuff of dreams, and it was pretty darn incredible. Negativity is more interesting. It is more sensational. It draws more hits for a website, more views for a video. It sells. What do you gain by being negative? What do you lose by being positive? Which sounds like the better choice to you? Martavious Irving is not particularly worried about those who criticize the hire of Bruce Weber as Kansas State’s new head basketball coach. The senior-to-be is just waiting for the season. “Once we start winning, I don’t think it’ll be a problem anymore,” Irving said. Illinois, where Weber coached from 2003 to 2012, finished ninth in the Big 10 conference last season and ended the year on a 2-12 slide. Weber attributed the struggles there to a young team – “six freshman and one returning starter” – and the disheartening effect of one close loss after another. Point guard Will Spradling seems to be buying into the coach’s potential. As is obvious from those comments, Spradling will not be transferring, as some reports had previously indicated. While it sounds like he considered leaving, and although he said “it helped a little bit” that Frank Martin is no longer the coach, Spradling said he thought he would have stayed at Kansas State regardless. Like Irving, Jordan Henriquez will be sticking around for his senior year. By his account, Weber made a positive first impression. Players will work out with the new coach for the first time on Monday. Weber said he looks forward to getting to know the players and see how he can help them improve. How those initial interactions play out will likely determine how many players stay and how many will go. Building trust is important for Weber, but he hopes to have at least one staff member who already has the players’ trust. He said he wanted to retain at least one current Kansas State assistant coach who knows the lay of the land and has existing relationships with players. In the meantime, the players appreciate the speed with which the administration conducted and completed the coaching search. Bruce Weber will be paid $1.5 million for the 2012-13 season, and his yearly salary will increase by $100,000 each year he stays with the Wildcats. 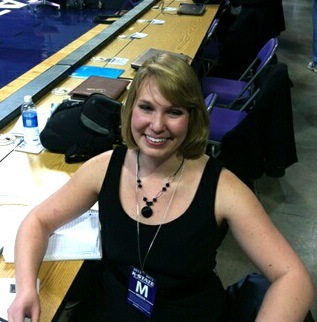 If Weber is still in Manhattan through 2016-17, he will make $1.9 million that year. If he coaches through the duration of his contract, he will accumulate $8.5 million in base salary over five years. Go through the list of bonuses he can attain, though, and it appears the total amount is likely to be much higher than that. Basically, there are eight levels of achievement, and Weber will receive an increasing percentage of his $1.5 million salary as a bonus based on what the team does. For example, if the Wildcats go 10-8 in the Big 12 or go to the NIT Weber gets a 4% bonus, if the team gets an NCAA bid he gets an 8% bonus, etc..
Alas, the percentages are not cumulative, but there is definitely potential for some major additional money for Weber. If Kansas State achieves at the level it did this season, Weber would earn $1,620,000 in his first year. Since Weber’s salary increases each year he coaches here, his bonuses increase also, since they are calculated as percentages of his salary. He can also earn bonuses based on the academic performance of the team and whether he is selected for coach of the year awards. If Kansas State wins the Big 12 tournament, gets a 1 or 2 seed in the NCAA tournament, or gets to the Sweet 16, Weber will have the opportunity to renegotiate his contract. He could also do that if he is named the Big 12 or National Coach of the Year. One last note: Weber’s contract is technically 5 years and 29 days – from April 2, 2012 to April 30, 2017.